If you went by my history books in school, there was a mere handful of interesting black people in history. I can count the women we learned about on the fingers of one hand – and that’s even if I’ve had a mishap with a rock hammer and had to bandage a couple. Lessee… there was of course Harriet Tubman*, and definitely Rosa Parks, and Sojourner Truth got mentioned, and… yep, we’re done. Teachers never even bothered to mention there was a girl who didn’t give up her seat before Rosa Parks. That honor belongs to Claudette [Colvin]. At a mere 15 years old, Claudette refused to give up her seat on a Montgomery bus on March 2, 1955 (9 months before Rosa happened), citing that it was her “constitutional right to sit here as much as that [White] lady”. The NAACP weighed the pros and cons of using Claudette as their call-to-action. Their Katniss Everdeen so to speak. However, they couldn’t let ya girl be great. Due to her age, her temperament, and the fact that she became pregnant around the time of her arrest, the NAACP was like “nah”. You can read more about her decision to sit down for her rights, and the repercussions of doing so, here. Forced to drop out of college by the fallout, she went on to become a nurse’s aide, and has had a long and productive life. She’s finally starting to get the recognition she deserves. Josephine Holloway was among the first activists to push the Girl Scouts to desegregate. In Canada, Viola Desmond challenged segregation in movie theaters. And there are many more unsung civil rights heroines here. But black history isn’t only about civil rights. What about science? Most of us know about George Washington Carver and his peanuts, but there have been extraordinary black women whose contributions should be recognized. Dr. Mae Jemison followed a lifelong dream to become a scientist and ended up becoming an astronaut – the first African American woman in space (autoplay video)! She mixed things up with a stint on Star Trek, became a doctor, danced, and joined the Peace Corps, too. 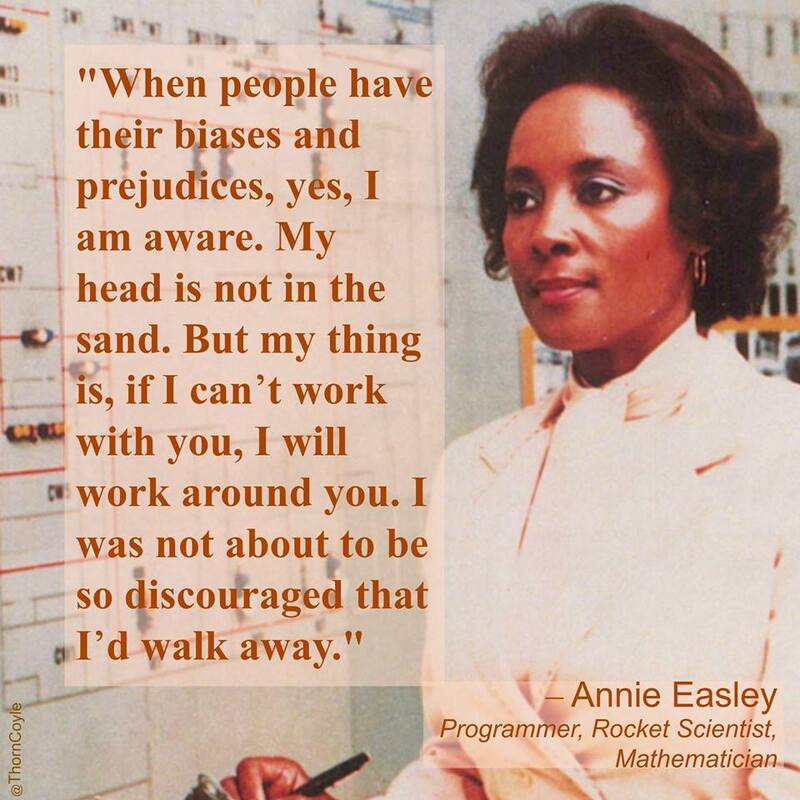 Of course, Dr. Jemison wouldn’t have gotten off the ground without Annie Easley helping make spaceflight possible in the first place. Image courtesy T. Thorn Coyle via Ania Maria Bula. And don’t forget to give her a shout-out for your hybrid vehicles, too. Here are eight more amazing black women making waves in STEM fields. Black women have been social justice warriors forever. Are you an intersectional feminist? You should definitely meet Kimberlé Crenshaw, who gave it a name, and advanced our understanding of how privileges and oppressions intersect. And it’s past time we stop the erasure of black women from reproductive rights struggles. In the arts and entertainment fields, black women have made important and sometimes surprising contributions. Christina Jenkins invented a hair weaving technique that allowed hair extensions to be attached directly to a person’s existing hair, rather than having to be pinned in. She patented the technique and was in demand worldwide. Amandla Stenberg is a pioneering voice for queer women of color in Hollywood. Lauren Anderson blazed a trail into ballet for black women. Black women have been composing incredible music for centuries. Here are ten whose works you can explore. And here are twenty women showing us that glamour is for black women, too. Finally, let us end with one of the neatest bits of history ever: one of Queen Victoria’s goddaughters was a black girl sold into slavery, brought to Britain as a gift to Queen Victoria when she sent an ambassador to try to end the African slave trade. Victoria saw to it that Sarah Forbes Bonetta was given an excellent education and married well, which at the time was one of the only ways for women to advance. Her life was short, but brilliant. Just think: all these incredible black women are a mere handful. We could be here for the next century talking about fascinating women of color who’ve changed history in ways huge and subtle. Don’t let them be forgotten! 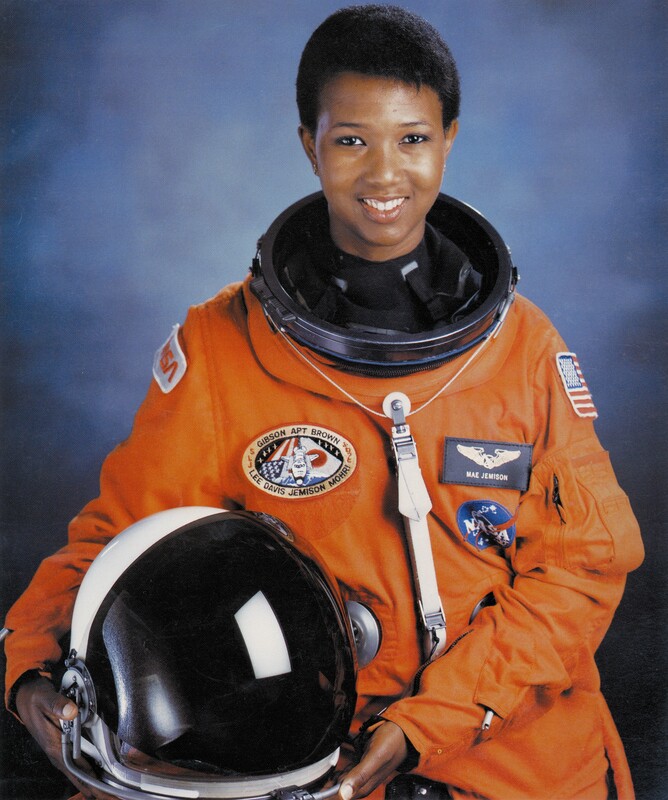 Dr. Mae C. Jemison. Image courtesy NASA. *Not Drunk History Harriet Tubman, though. So much we (privileged & sheltered white Aussie male here) do not know. So much we do not hear about and don’t appreciate the magnitude of and struggle to understand. Because our lives have always been so much easier and less unfairly obstructed and most of us don’t even yet know it. So many heroes we do not know. But need to know. These heroes did so much and faced such hatred, it is hard for us to fathom it. Huge respect to them all and listening.